Folding table lamp which can fix it on your table or other places, low power consumption and soft LED light is suitbale for using in dark. 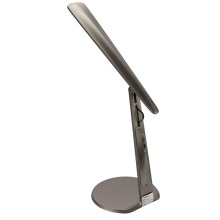 180° adjustable design and flexible folding can ajust any light direction as you like. Large lighting area and long service life is eco-friendly and energy-saving. Stable base deign is non-slip. Touched switch has sensitive reaction. Soft light can protect your eyes in the long time reading and working.